عندما تزور هذه المدينة رائعة الجمال، ستشعر أنك في بيتك في Guam Plaza Resort & Spa الذي يقدم لك إقامة متميزة و خدمات عظيمة. يمكن من هنا للضيوف الاستمتاع بسهولة الوصول إلى كل ما تقدمه هذه المدينة النابضة بالحياة. يضفي محيط الفندق اللطيف وقربه من أكثر المعالم السياحية جذبًا سحرًا خاصًا على هذا الفندق. استمتع بالخدمات الراقية والضيافة التي لا مثيل لها بهذا الفندق في هذه المدينة رائعة الجمال. يمكن لضيوف الفندق الاستمتاع بالميزات التالية على أرض الفندق: واي فاي مجاني في جميع الغرف, تأجير واي فاي محمول, متجر هدايا/تذكارات, خدمة غسيل ذاتية, خدمات بريدية. يمكن للنزلاء الاختيار من ضمن مجموعة من الغرف المصممة بعناية لتعكس جواً من الراحة، والتي يتجاوز عددها 505. كما أن مجموعة الخدمات الواسعة الموجودة في الفندق لضمان راحتك تترك لك الكثير من الخيارات لقضاء وقتك أثناء فترة إقامتك. يحظى فندق Guam Plaza Resort & Spa بموقع ممتاز وخدمات يصعب منافستها. يتم إغلاق منتزه طرزا المائي كل أربعاء. We had a booking under Agoda last January . When we checked in the staff ( Cindy) is not friendly. She mentioned to me that breakfast was not included and I told her pls read my agoda bookings . She did not read my bookings and we are a group of 10 people. I booked 2 twin rooms and 2 triple rooms from Feb 27-March 3.. It took us almost 2 hours just to have the rooms. We got 4 rooms while waiting for the assigned rooms to us. We asked help from the other staff to expedite our bookin gs coz we are all tired but she answered back to us that it is not her job. But she was assisting another guests but we were ahead of them.The rooms need improvements and the aircon needs cleaning coz it takes time to cool the room. We are all disappointed because the staff are dominated by Filipinos but they are not accomodating. WE are 6 Filipinos and 2 are Americans and 2 are canadian . We are not happy and satisfied with them. It's not the worst hotel. But the cleanliness needs work. So. Much. Hair. 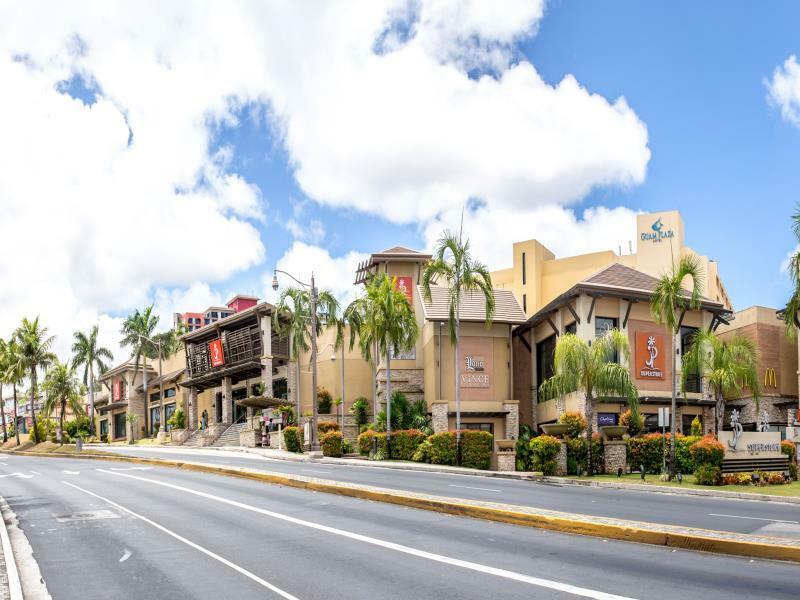 Located in the centre area of Tumon with lots of restaurants and shopping malls outside. Shuttle bus stop is just in front of the hotel. The location is very convenient very close to Lamlam Tours and Transportation office we're you can book for a whole day bus ride and very close to the location of the SANDCASTLE Show. Local restaurants are just outside the hotel. 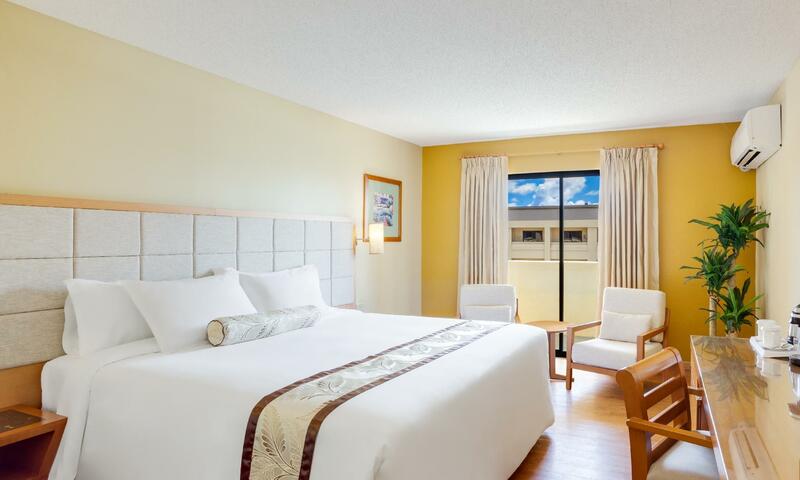 This is a perfect base for your Guam stay. Close to the beach, a lot of restaurants nearby and with a bus stop at JP Store. The Mc Donald's outside the store is 24 hrs open. Will definitely stay again. Excellent location, right beside T Galleria by DFS and a short walk from the beach. There's also a store and restaurants on the first fooor of the building. The rooms were basic - clean but could use bigger pillows and a better TV. Staff was great; special mention to the chef and staff of Rootz. Room is spacious and location is superb. Rootz serves really good food too. Its a bit aged but nevertheless the stay was largely pleasant though the bed was extremely hard. Facilities are a bit aged but not a huge issue. Will recommend to all who are cost-conscious but demand decent comfortability. Convenient location: 150 meters to DFS. You can take buses from DFS to many places. Many stores and restaurants within walking distance. Clean and comfortable room. Has water kettle in the room. The only problem is: Wifi connection is not very good - got disconnected pretty often. Situated right in the middle of the shopping district so location is superb. Hotel was fully booked though and wasn't very accommodating with the requests I made via Agoda. A good choice for travelers who want to stay in the middle of the shopping district but don't want to splurge on beach-front 5-star hotels. You won't be able to find another hotel that has better value and location. It's right smack in the middle of the main shopping street at the most popular junction; it has useful stores in the same building including a convenience store, a department store, Macdonalds, etc; it's a 3 minute walk from the beach; there's a pretty fun and thrilling water park behind the property. And the prices are much better than the other hotels in the area. The location is smack in the center of everything. Very convenient in accessing the beach, the restaurants, the malls, the Red Guahan Bus stop. 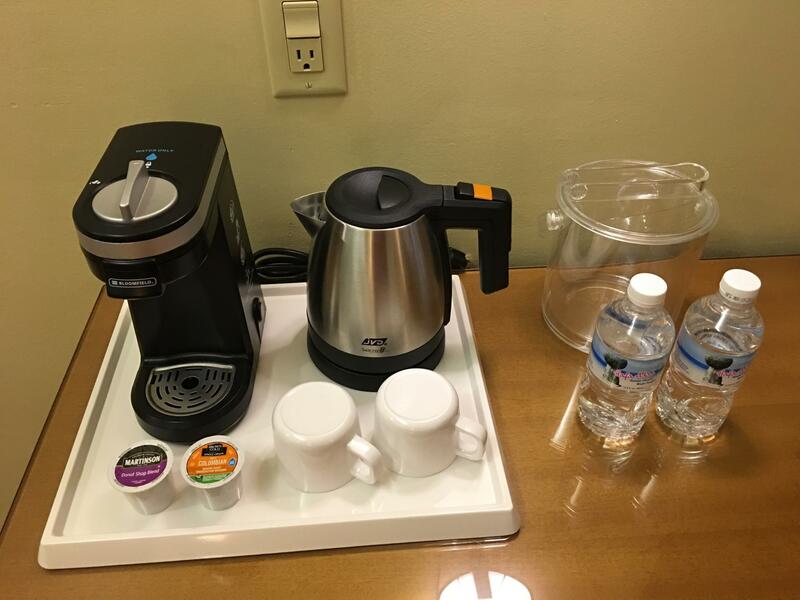 No complimentary water, no free coffee sachets or tea bags, nor heater for drinking water. The blow dryer was a welcome sight. The ministore at the Lobby (also ran by JP superstore) offers affordably priced souvenir items. McDonald's is just a few steps away, the hotel lobby is connected to JP Superstore. Looking forward to my next stay. Check in and check out was fast. and the hotel workers are all courteous. I booked a deluxe twin with a view of the swimming pool and the ocean from the balcony. 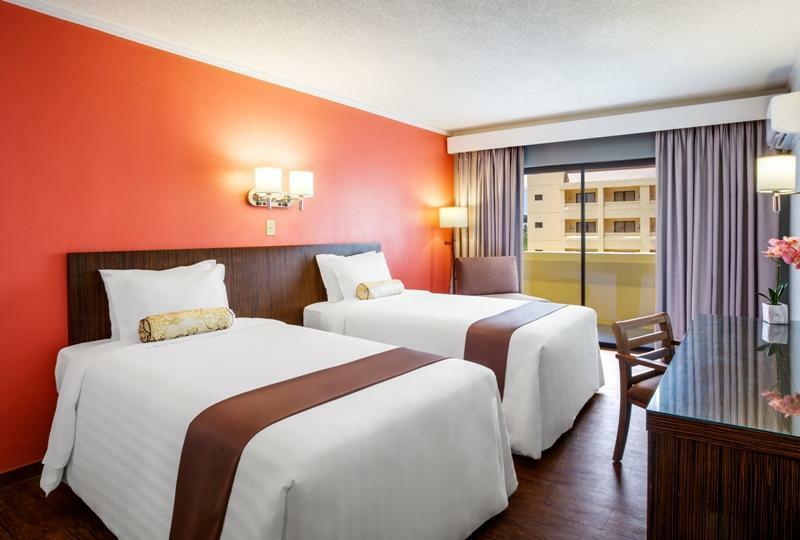 The hotel is a 5-minute walk to the beach and near restaurants and shops and other hotels. We've stayed there last November 2017 for Thanksgiving. Our flight schedule has changed so I booked an additional day. I made separate booking because the rate was better than amending it. They did not have an early check-in so we paid additional charges even if we're going to stay for a week. I understood it because 'twas peak season, thanks to McDonald's for letting us stay and have some free wifi. i think is one of the more bang for the buck hotel especially if you are not renting a car. located in a hotspot area that is very convenient . typical dated hotel as you find in guam. staff is very friendly. if you have a family you probably want to splurge for a hotel on the beach that has more activities but this is great for people who don't bother with that. near to DFS and connected another mall. there's a convenient store on the ground floor. This is a perfect location hotel just beside Duty Free and many shops. However, floors very dusty that you can feel it in your feet. You need to wear slippers inside the room. If they can't simply vacuum the floors, this give me doubt if they really replaced the sheets used by previous guests. If shopping is your pleasure, this is a winner. Ideally situated. Restaurant and malls is walking distance. Bus stop is very accessible. Good value for money. 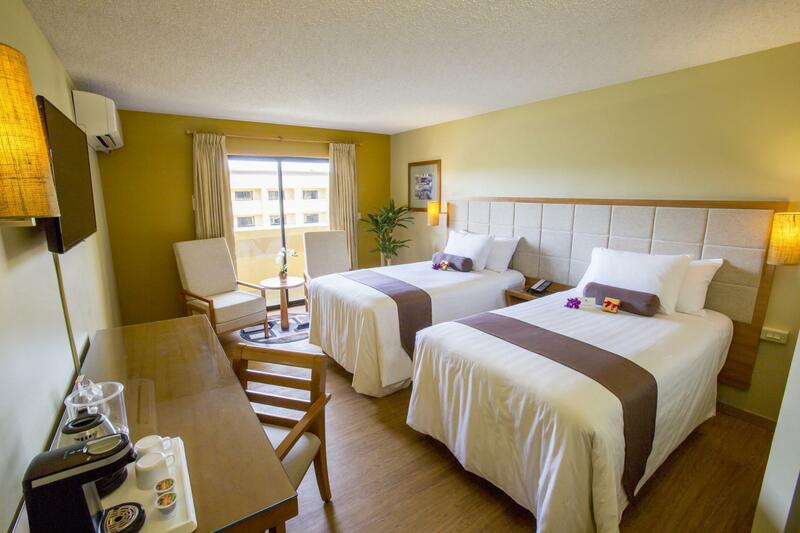 Comfy beds, clean rooms and just few steps from the beach and restaurants. The pool needs a major reno. Best choice in terms of price, location and everything!